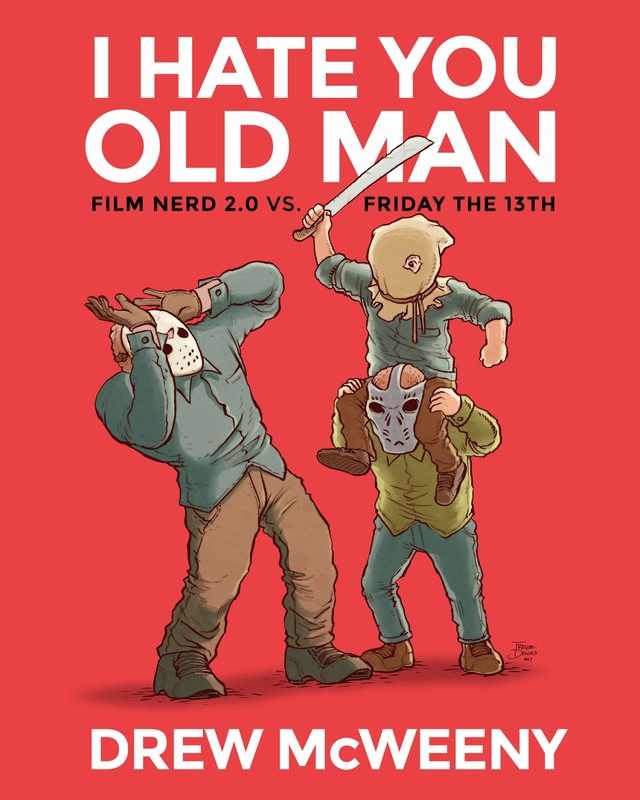 You, Me and Movies: Book Review: "I Hate You, Old Man: Film Nerd 2.0 vs. Friday The 13th"
Book Review: "I Hate You, Old Man: Film Nerd 2.0 vs. Friday The 13th"
I Hate You, Old Man: Film Nerd 2.0 vs Friday The 13th"
Former Hitfix film critic turned independent digital magazine writer Drew McWeeny has written another book. Back at the start of this year, I reviewed Drew McWeeny's first book. Something that McWeeny has defined himself by is how to approach showing media to our children. In his first book, he offered a timeline to view the "Star Wars" movies to your little tykes, which gives the saga more emotional heft. Now, in his second book, he is writing about how to introduce the horror genre to young, budding horror fans. 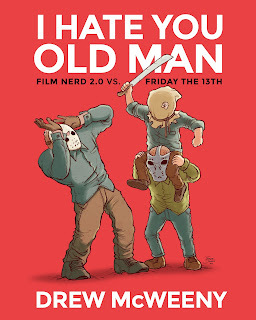 Much like his first book, much like his Film Nerd 2.0 series (A column of reviews where McWeeny not only re-reviewed a host of older movies, but recorded his children's reactions to them), this is a unique, informed and fun little book. This is something that can help a parent approach this kind of media and also a quick read that will put a smile on your face. In the book, McWeeny details his own personal history with the horror genre. Which films he loves, which films maybe didn't work for him, and the films that nearly killed his enthusiasm for the genre itself. McWeeny also jumps into the the history his sons Toshi (around 12 years old) and Allen (around 9 years old). McWeeny discusses how his sons slowly fell in love with the genre and how as a father McWeeny carefully introduced the genre to his sons. It wasn't always easy though, McWeeny recalls a moment when he showed Toshi "The Twilight Zone Movie" years ago, and how Dan Aykroyd's "You wanna see something really scary?" scene sent Toshi out of the room. Its nice when somebody can admit their mistakes and discuss how he made those moments better. McWeeny also offers two lists in his book. The first list is 150 Films You Should Share With A Budding Horror Fans. Its a list that is exactly how it sounds. This list includes the older Universal Monster movies, comedies like "Young Frankenstein" and "Ghostbusters," and most 1950's science fiction movies. Easy enough to understand why those titles would fit that bill. None of those movies are particularly scary, and even if some of those movies have tense or creepy moments, its not damaging horror. Horror is a genre that challenges our inner demons. Its a gateway to darkness that does engulf our world. If you have young adults and children interested in the genre, you have to lay them down carefully in it, not destroy their psyche right out of the gate. Although I will say that "Carrie" shows up on the 150, and that I found a little surprising. But perhaps that is due to my own personal history with it. I saw "Carrie" at a young age simply because I read "Carrie" at a young age. It was the first Stephen King book I read that turned me into a die-hard fan. When I watched the movie, there were some moments that kept me up that night. There are some moments I think require a certain amount of maturity in children, like understanding Carrie White's crazy mother. But overall, this list is a safe list, and definitely I will use with my own children, if scary movies are their thing. One of my favorite things about the book is how McWeeny stresses to use this 150 titles for budding horror fans. He writes in his book about how not every movie fan is created equal. Some people just do not like being scared. At all. They don't find it fun. They don't find it entertaining. They want nothing to do with it. I remember when my wife and I first started dating, everyone I knew had seen "Paranormal Activity" in the theater and were hyping it up big time. I had to talk my wife into seeing it with me, and trust me it took two days. While she slept like a baby the evening after, I felt bad after ward. People may not like that type of release and McWeeny discusses the importance of never pushing horror on anybody. I think its really unsafe and unwise to push anything we love on our kids, simply because they should follow their own interests. But if your children happen to like horror, the 150 titles McWeeny suggests are a great place to start. He also lists 75 titles you should NOT show budding horror fans at all. The list is pretty self-explanatory and I can't honestly say I was surprised by the choices. Of course if you have a ten year old who is curious about the horror genre, the worst place to start would be showing them "The Exorcist," or "Texas Chainsaw Massacre" or "Peeping Tom" or "The Shining." The point is get your kids to find the fun in a film genre, not destroy the genre completely for them. I don't know a single parent who would start their horror fans with the extreme stuff, but I do remember my ex-girlfriends sister showed "The Messengers" two three pre-five year old children she was babysitting at the time. Oh my, I wish I knew how that one went over. So I guess making this list of 75 titles isn't so self-explanatory? The most important takeaway from this book is what McWeeny has stressed since the beginning of his Film Nerd 2.0 excerise. That point is we need to listen to our children. We need to discuss the media they digest. Especially in a world where so much media is available to them at a given time. We can't allow our children to have no filter, but at the same time its also not good to just blindly band things from them. There needs to be a balance to it, and that comes with parents and children having a conversation about media. As McWeeny records his children's reactions to certain horror movies in the beginning of this book, its amazing how wise beyond their years his children are. That's because McWeeny has those conversations with his children and he knows as a father what his boys are ready for. Sounds easy, right? Well, after four years of working and running a daycare, I can say with some authority that there are several parents who don't get this idea at all. There are three-year-old children playing Child's Play and The Walking Dead instead of Cops and Robbers, and they are not afraid to be overly-violent. I knew a kid who boasts about seeing Deadpool, and rubbed it in kids faces, telling them that they are dumb for liking Batman, Superman and Iron Man movies because they don't curse or slice their enemies in half. There is no understanding of subtext or context, and clearly no conversation. This is parents wanting to be their children's friends instead of being their parent. Like I said above, there needs to be a balance on what to show our children and what not to show. McWeeny knows what his kids can handle by having the conversation about the media they ingest and how they react to it. That's what it should be all about when it comes to sharing media with the next generations. Wanna buy this book? click here! You can also use that website to listen to McWeeny's groovy podcast 80s All Over and you can buy his other book and check out his digital magazine, Pulp and Popcorn. More and more, McWeeny is becoming an advocate to how to delicately and responsibly share media with our children, his two books are filled with tips I hope to use one day when and if my own children become as movie crazy as I am. I hope these books break out and more people starting looking into these readings, its deeply original and sincerely heartfelt.